MBC provides resources to facilitate presentations about each composer in our published volumes. Bullet Point Biographies and PDF maps representing the geography of each composer’s life make sharing information about these remarkable individuals easy and exciting! 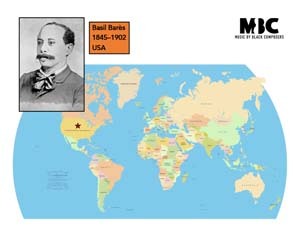 Basile Barès was an American composer who was born into slavery in New Orleans, Louisiana in 1845. He grew up working in the music store of his enslaver’s family, which is where he probably first learned to play the piano and began to compose. He wrote “Louisiana Infantrymen’s Grand Polka” when he was only 16 years old. It is the only American piece that was published and given copyright protection to an enslaved composer! After becoming free after the Civil War, he traveled to Paris where he played piano at the Paris International Exposition. 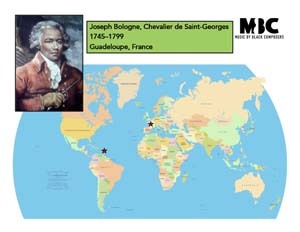 Joseph Bologne (boh-LOHN-yuh), known as the Chevalier (shuh-val-YEY) de Saint-Georges (sain-JOHRJ), was born in 1745 on the island of Guadeloupe (gwah-duh-LOOP) in the Caribbean. He moved to France with his parents when he was six years old, where he studied sword fighting and music. He became the most important composer in France during his lifetime—his music inspired other composers, including Mozart. 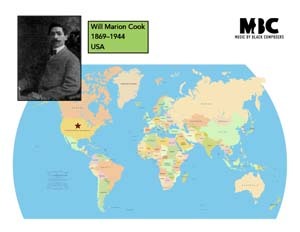 Will Marion Cook was born in 1869 in Washington, DC and grew up with his grandparents in Chattanooga, Tennessee. When he was just 21, he became the director of an orchestra, and he studied at some of the best classical music schools in the United States. He faced discrimination as a classical performer, so he became discouraged and turned to popular theater music. His unique classical music background allowed him to help create a new type of popular song for Black American musical comedies in the early 1900s. 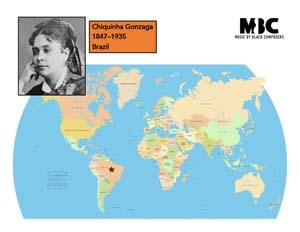 Francisca “Chiquinha (she-KEEN-ya)” Gonzaga was born in 1847 and lived in Rio de Janeiro, which is one of the biggest cities in the South American country of Brazil. She got married, but her husband did not want her to have a musical career. Even though it was very scandalous at the time, Gonzaga divorced him. She wrote more than 2,000 pieces throughout her lifetime, and became the first woman in Brazil to conduct an orchestra. 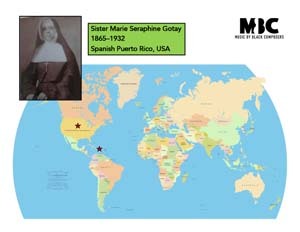 Sister Marie-Seraphine Gotay (go-TAY) was born in 1865 in San Juan, Puerto Rico, and moved to New Orleans, Louisiana when she was 17 years old. In New Orleans, she joined the Sisters of the Holy Family and became a Catholic nun. There were many Black composers in New Orleans in the 1800s, but Sister Gotay is the only known Black woman composer from that time. 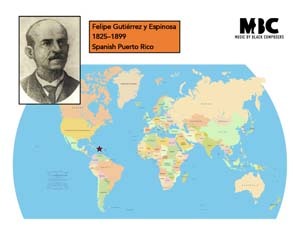 Felipe Gutiérrez (y) Espinosa was born in 1825 in San Juan, which is the capital city of the Caribbean island of Puerto Rico. He became one of the first classical composers born on the island, and the most important Puerto Rican composer of operas and religious music in the 1800s. He ran a free music school so that he could teach and share music with anyone who wished to learn. 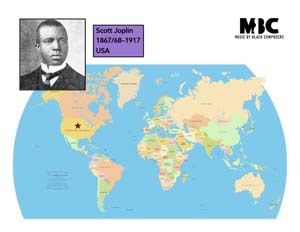 Scott Joplin was an American composer, performer, and teacher who was born in 1867 or 1868. He is best known for writing a style of music called ragtime, and his “Maple Leaf Rag” became the most famous ragtime piece in history. He also wrote music for a ballet and two operas. Kenneth Kafui (ka-FOO-ee) is a composer and teacher from the West African country of Ghana where he was born in 1951. He received an award for best contemporary classical music composer in Ghana in 1987. His music often includes Ghanaian rhythms and themes. 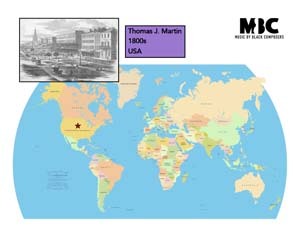 Thomas J. Martin was an American composer who was active in New Orleans, Louisiana in the mid-1800s. He was a free man of color in the years before the Civil War, and he published many pieces between 1854 and 1860. He played the guitar and the piano, and he operated a large teaching studio in New Orleans for many years. 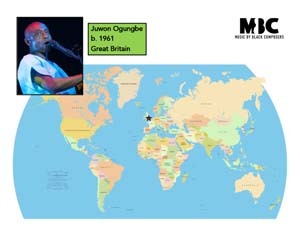 Juwon Ogungbe (joo-WAHN oh-GOONG-bey) is a composer and performer who was born in 1961 in London, England. His parents are of Yoruba ethnic heritage from the West African country of Nigeria. His musical style combines sounds from classical music, African instruments and rhythms, and pop music. 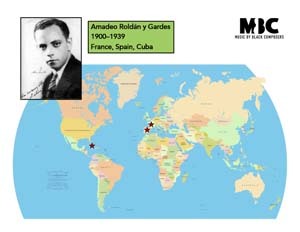 Amadeo Roldán (Gardes) was a composer, violinist, conductor, and teacher who was born in Paris, France in 1900. His parents were from the Caribbean country of Cuba. When he was 21, he moved to Havana, Cuba, where he lived for the rest of his life, and he became a leader of cultural activities in the city. He was the conductor of the Havana Philharmonic Orchestra, and he became a professor of composition and director of the Havana Municipal Conservatory. In 1959, the school was renamed the Amadeo Roldán Conservatory in memory of Roldán. 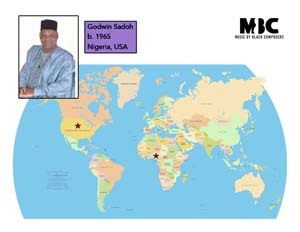 Godwin Sadoh is a composer, instrumentalist, choral conductor, and scholar who was born in 1965 in the West African country of Nigeria. He did advanced study of music in the United States, where he became the first African to earn a doctoral degree in organ performance anywhere in the world. He composes for diverse musical ensembles and styles, and his music has been performed all around the world. 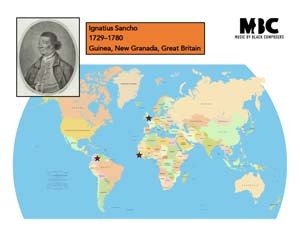 Ignatius Sancho was born in 1729 on a slave ship off the coast of Guinea in West Africa, and was taken to the Spanish colony of New Granada in South America. He was sent to England when he was two years old, where he freed when he was a young man after his enslaver died. He became the first Black composer in history to have his music published! 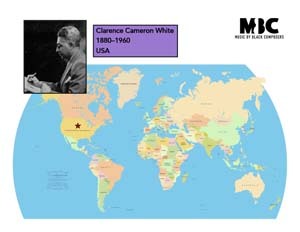 Clarence Cameron White was an American composer and violinist who was born in Clarksville, Tennessee in 1880. He was one of the best violinists of his day, and he gave concert tours throughout the United States with his wife, Beatrice Warrick White, accompanying him on the piano. His compositions were often influenced by spirituals and African-American folk music. Some of his operas were performed in Carnegie Hall and the Metropolitan Opera House in New York City. The famous violinist Jascha Heifetz recorded one of his pieces. 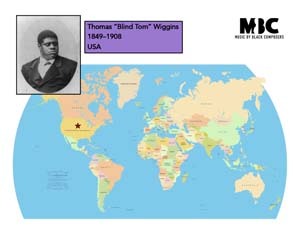 Thomas Green Wiggins, known as “Blind Tom,” was born enslaved in Georgia in 1849, but he became one of the most famous American entertainers of the 1800s. He was autistic, which means that he experienced the world in certain unique ways. Some autistic people like Wiggins also have certain extraordinary skills—some of Wiggins’s skills were performing and composing amazing music. He could play music on the piano that he had only heard once, play difficult classical pieces with his back turned to the piano, and could even perform three songs at once! Horace Weston was an American composer and banjo player who was born to free parents in Connecticut in 1825. He became a virtuoso banjoist, and he played in popular theater performances of the day called minstrel shows. He was one of the first African-American musicians to become famous as a banjo player, and his style influenced many other musicians.